In this page trigonometry problems set4 we are going to see practice questions in this topic.Here we you can find solution with detailed explanation. These identities are applied in both ways ,left to right or right to left.So we have to memories all the identities. Instead of tan θ we can write sin θ/cos θ. Like that instead of cot θ we can write cos θ/sin θ. Since the denominators are not same let us take L.C.M for both fractions. 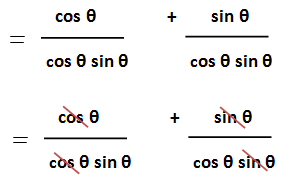 Now we are going to take (cos θ + sin θ) from the numerator. 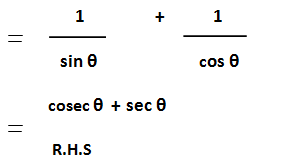 Now we are plugging the value of cos ² θ + sin ² θ that is 1.
both cos θ and sin θ will get cancelled in the numerator and denominators from the first and second fraction respectively. 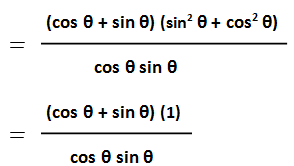 We have used reciprocal formula ti get the value of 1/sin θ and 1/cos θ.
we can write cos² θ instead of 1 - sin² θ form the identity cos² θ + sin² θ = 1.
in the next step we are going to write 1/cos²θ instead of sec² θ using reciprocal formula. Both cos² θ both are in the numerator and denominator will get cancelled. Finally we get 1. From this identity we come to know the value of (1 + tan² θ) that is sec²θ.